Helloooo, welcome to one of the most delicious posts on I Knead to Eat! 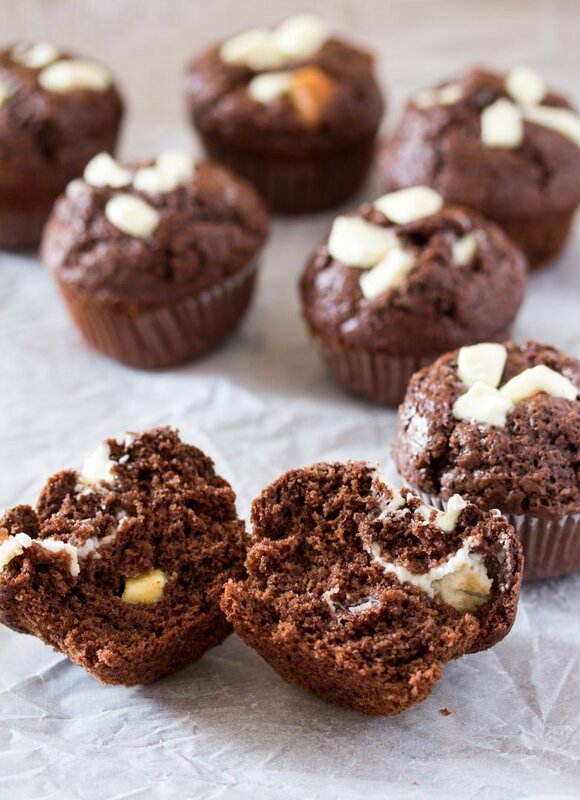 And say hello to your new indulgent breakfast – Cream Cheese Filled Chocolate Muffins that are perfect for all sorts of emergencies in life. Like a broken nail, or a cranky toddler, or getting late for work (and almost, but not, missing breakfast if you have a stash of these life changing muffins). Now let’s talk about these cream cheese filled muffins. Let’s be honest, they’re not like the normal daily stash of muffins which are fairly healthy to have for breakfast. 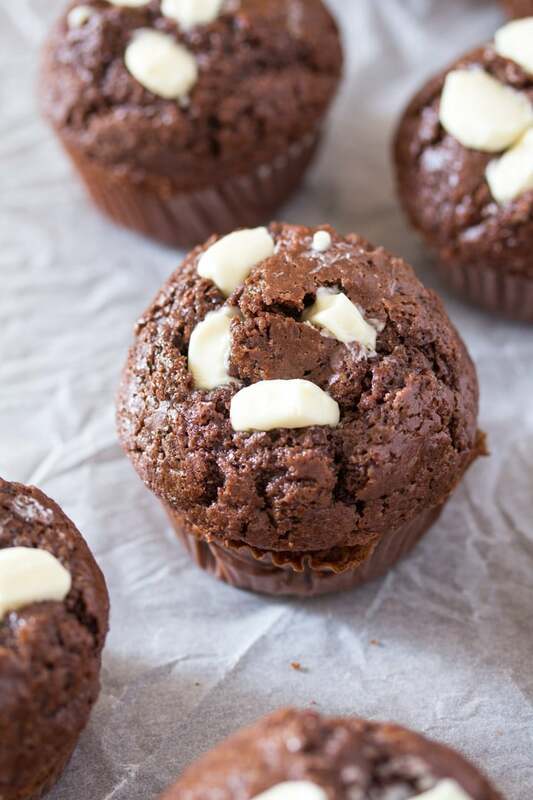 These are the kind of muffins that you keep a stash for when you just can’t do life anymore and need to have something chocolatey and indulgey (not a word, I know) and need it asap. And these cream cheese filled muffins are fast to make, baby – only 30 minutes! And oh so delicious. That mind blowing delicious cream cheese filling in the middle. Oooh, la la! 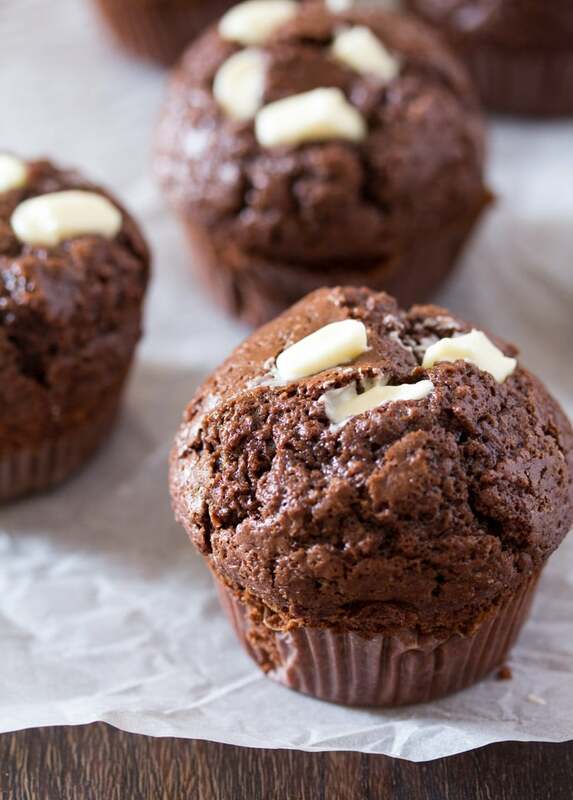 And if you’re looking for some normal (but just as delicious) muffins, then click here to find the recipe to the most delicious no mixer double chocolate muffins, that happen to be pretty popular on my blog. 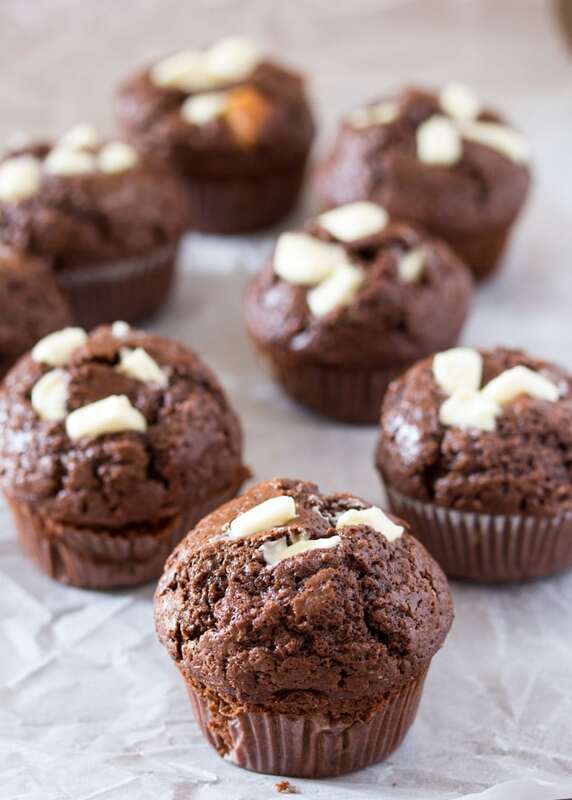 Now that we’re talking about the no mixer double chocolate muffins on the blog, let me point out here that the batter of the muffin that I use for today’s recipe is exactly the same (except I didn’t add coffee to this batter cos like I forgot). The cream cheese filling (the shining star of this recipe) is so, so, so, simple (we’re talking just two ingredients) and when it’s baked into the muffin and you take that first bite of the still warm muffin, it tastes just like cheesecake (without the graham cracker crust, though). 1.) You successfully did the laundry, but didn’t fold it and that guilt is drowning you. Eat these cream cheese filled muffins, they’ll cheer you up. 2.) Your toddler spilled that cup of juice for the 1000th time, even after you asked them to be careful multiple times. That creamy filling in the muffins is calling your name. 3.) You’re craving chocolate, but you’re also craving cheesecake. Now you can have both in muffin form. 4.) You slept only 3 hours last night, cos your newborn decided it was party time. You deserve these cream cheese filled muffins with a big mug of coffee. Basically, you can have these cream cheese filled muffins whenever you want. I usually like to have them like always. Okay, maybe not always, thanks to those little things called calories, but I’d like to have them always. 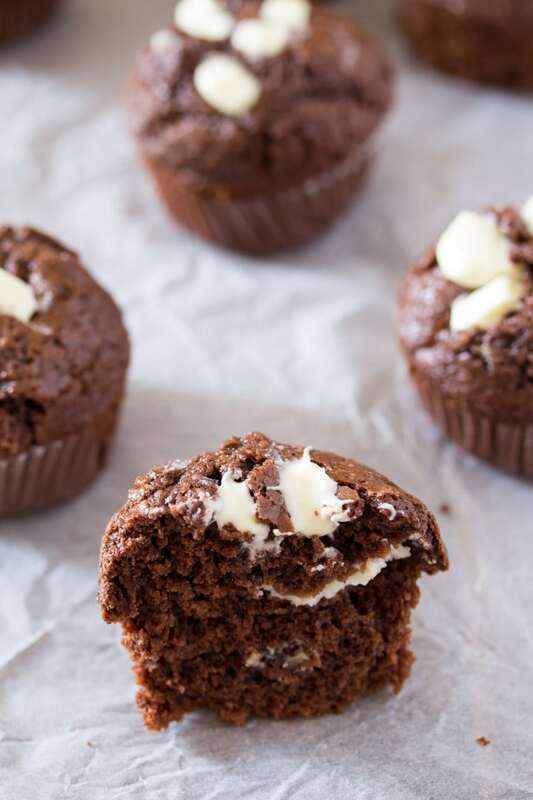 These Cream Cheese Filled Chocolate Muffins are the perfect indulgent treat. 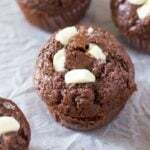 An easy to make chocolate muffin recipe, which is filled with a divine cream cheese filling and topped with white chocolate chunks. Preheat oven to 220C/425F degrees. Line the muffin tin with 12 paper cups. In a medium sized bowl, sift together the all purpose flour, unsweetened cocoa powder, baking powder, baking soda, salt and granulated sugar. In a separate bowl, whisk together the eggs with the buttermilk, oil, melted butter, and vanilla extract. Pour this mixture into the dry ingredients and mix until just combined. Do not over mix. The batter will be thick and lumpy. To make the cream cheese filling: Place the cream cheese in a microwave safe bowl and heat on low power for about 30 seconds. Stir in the granulated sugar until combined. Drop about 2 tablespoons of the muffin batter into each muffin cup. Top with a tablespoon of the cream cheese filling. Add the remaining muffin batter until the muffin cups are almost full. Bake the muffins at 220 C / 425 F for about 3 minutes, and then reduce the oven temperature to 180 C / 350 F (do not remove the muffin tin from oven). Bake for an additional 17-20 minutes until a tooth pick inserted comes out clean. Remove from oven and gently press in the chocolate chunks on the muffins tops. Transfer to a wire rack and let cool for about 15 minutes.